CF/CFS Single Hole Solderless | Cal Fasteners, Inc.
For use with Copper Conductors only! In order to maximize strength and conductivity, the Single Hole Connectors are made of high strength pure electrolytic copper. The CF and CFS conductors are inserted between an arched pressure bar and a V-shaped bottom collar. This positions the wire for a positive contact and gives maximum security. 'CF' and the 'CFS' is also reusable. Installation can be done with a a set pliers, or a wrench. The CF/CFS comes with a plain finish and they are for use with copper conductors only! Please see our CMC catalog page for the standard sizes. Please not that many of the standard catalog parts can be altered according to your requirements. 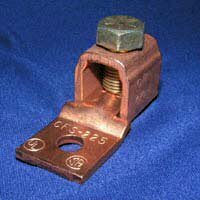 For more information on these copper CF or CFS style lugs, contact Cal Fasteners to find out more or contact us to Request a quote.